Dubbed by some of our guests as a ‘hidden jewel’, this splendidly appointed room provides the ultimate hideaway! Two king-size beds and ample sitting area with fireplace, LCD flat screen television; private fridge, separate shower and large Jacuzzi tub tucked beneath skylights, all combine to create paradise under the stars. 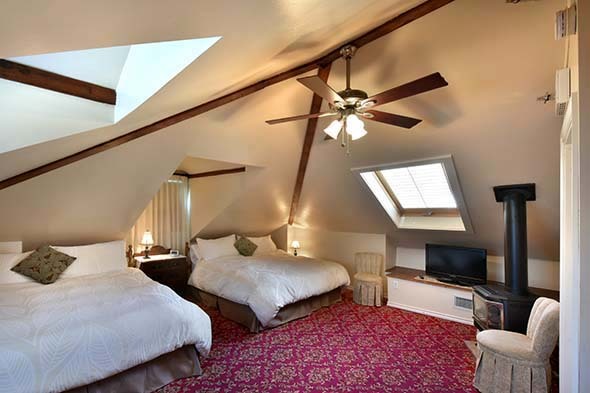 The Loft room is on the third floor and as the second flight of stairs are steep and narrow will not be suitable for guests that have trouble with stairs. Also, as the Loft room has angled ceilings it may not be suitable for taller guests. There is a $45 per person per night extra charge for over double occupancy. Maxiumum 4 people.